The Berry Farm & Orchard was always a family farm, until April of 2017 when the family farm dreams of being a successful business became a reality. Stacey Mullen and Benji Adam, founders of "The Berry Farm" put this dream into effect. The Berry Farm & Orchard grows a wide variety of fruit. Back in 2010 Benji started planting apple and peach trees in hopes to carry on the family tradition of a produce business. He and Stacey met in 2011 and started expanding the varieties of fruit. Plums, Apricots, Pluots, and Flat peaches were planted. In 2015 a large blueberry patch with about 700 bushes were planted. Raspberry and strawberry patches were added too! Finally, in 2017 the farm's new plantings are now mature and ready for substantial harvests. In 2018, high density trellis apples of honeycrisp, evercrisp, and gala, were planted. They also doubled the raspberry patch with specialty berries, such as logan, yellow raspberries, blackberries and more! 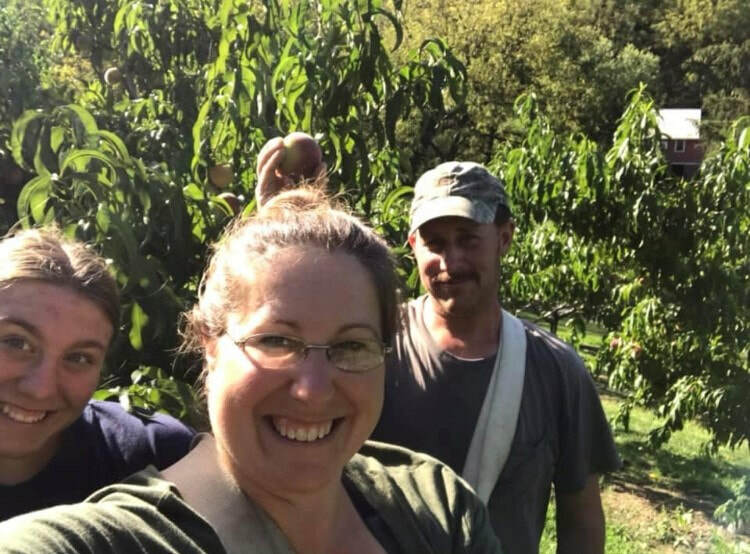 Together they work as a team, there's nothing Benji can't grow; and Stacey, a Penn State grad with a degree in Agriculture, having worked in the produce industry for the last 15 years and managed a large commercial orchard, hope to make The Berry Farm a successful produce business. Stacey's daughter hopes to carry on the tradition and loves helping on the farm!